Thank you for coming to honor my mom. I never get a turnout like this for my book signings . . . In early 1926, shortly before the birth of my dad, a wise man wrote, “History runs on a circular track, but spectators see time pass but once.” That man was Walter Trumbull, sports editor of the New York Post. Sportswriters were often armchair philosophers back then, and this statement by Trumbull, so simple yet so profound, has stuck with me for many years. In 1918 and just after the Great War (WWI), Congress passed restrictive immigration measures. President Woodrow Wilson vetoed them, but the 1920 election of Warren Harding and what he called “a Return to Normalcy” (though no such word existed) led to these measures becoming the law of the land. They culminated in the Immigration Act of 1924, a National Origins quota system that limited annual immigration from a country to 2% of that nation’s population in the US in 1890. Why base the law on the 1890 census and not the more recent 1920 census? Because 1890 was the beginning of the mass immigration to the US from southern and eastern Europe, which included many Jews and Italians. And by the way, Asians were banned altogether. Zero per cent. The result was that the few immigrants who enter the country were from nations like England and Ireland . . . and perhaps places like Norway. Make no mistake: When Hitler rose to power in Germany in 1933, for most of the rest of that decade of the Thirties, the problem was not GETTING OUT. People could get out. The problem was GETTING IN. Anywhere. Almost everywhere. In 1933, a four-year-old girl said good-bye to her grandparents, her father’s parents. With Hitler’s rise to power in Germany, they decided to GET OUT. And they decided to go where they could GET IN, to Palestine. In 1936, that little girl, now age seven, prepared to join her grandparents in Palestine. Before the move, her father made a preparatory trip. While walking on the streets of Jerusalem with his father, gunfire broke out, and they began running, quite literally, for their lives. They ran to a building whose front door was fortuitously unlocked. They survived what would become the Palestinian uprising of 1930-1939, the “first Intifada before the first Intifada.” The girl’s father decided he could not move his family (which consisted of two young girls and his wife) to Palestine. He instead began developing an alternate plan. Two years later, the little girl and her family prepared to move to the United States. Before their departure, her father made one last appeal to his in-laws that they too had to leave Frankfurt now, that time was running out. Eighty years later, that little girl (now approaching age 89) vividly remembered the ensuing scene. Her grandfather walked to the entrance of his massive library, with floor-to-ceiling books on all walls. (I think of a library from a movie scene, such as “Finding Forrester.”) With a wave of his arm across the library, her grandfather said, “My books. I cannot leave my books.” She also remembered him saying something about protection from the League of Nations. Just before Kristallnacht in the Fall of 1938, that nine-year-old girl and her family departed for New York. Seventy-five years later, in 2013, my family (with Colleen and the kids) visited the location where that girl’s grandfather (the one who stayed behind) died. In Mauthausen, the concentration camp in western Austria, Pincus Buchbinder died in the gas chambers on his 66th birthday, June 29, 1942. Fast-forward again, this time by forty years, to 2018. Last weekend, the daughter of one of those 1988 immigrant girls celebrated her Bat Mitzvah in Tacoma. I used up my Fourth Life last week. After 3 near-death experiences, I wasn’t expecting another. I certainly wasn’t planning it. These episodes are always unplanned. When I got to Emergency at Swedish Hospital, my blood pressure was 61 over 40. My nurse tech said he’d been here 10 years & had never seen one that low. I was also severely dehydrated; my kidneys were also not working properly. I was feeling so weak & light-headed that I thought I’d stay in bed for the night. NOT A GOOD IDEA, I’ve been told more than once since I got here. (Colleen & my GI Doctor on call had convinced me it was not a good idea either: “Get thee to a hospital emergency room. Now.”) Had I not done so, I would have been “resting” a lot longer than one night. As an aside, we hear so much about the dangers of high BP that I figured low BP can’t be bad. Won’t make that deadly mistake again. Here’s the back story, now that I’ve been “stabilized.” I’ve been dealing with lower back stenosis (sort of like bone spurs in the spinal column, pushing against nerves). for about 9 months. PT & Pilates have helped A LOT & will help me avoid back surgery. (Gosh, I hope Steve Kerr gets relief!) But I have been experiencing a very low energy level & overall achiness, which I attributed to the exertion required to walk. Chronic fatigue was just a corollary of the stenosis, I thought. WRONG AGAIN. But, no, my doctor said we have to figure out why I’m anemic, why I have blood loss. With a family history of colon cancer (which would explain the results), I had to do that no-so-favorite procedure, a colonoscopy (my 3rd). By the way, I had seen no traces of blood you-know-where . I had it done a few days ago. No signs of colon cancer, not even any polyps. But part of my colon is inflamed, even though I’ve never felt heartburn or pain. As the pathology reports come in & help define treatment (antibiotics, maybe dietary restrictions-hopefully inc. not Szechuan food; Lionhead & its fiery dishes is a favorite restaurant of mine), all I could do was wait. I was given a massive amount of fluids through IV’s in Emergency, and my BP slowly rose and stabilized. My care here was so wonderful & thorough, doctors, nurses, & techs. Truly Caring care, THANK YOU! Don’t try it on your own. As I said, you cannot plan it or plan for it-dying, that is. For me, it’s on to my Fifth Life. I really should not count on having Nine (though Futon, our cat, is approaching age 20). I’m just thankful for and have been blessed with Five. I first met Urban Shocker in the summer of 1998. 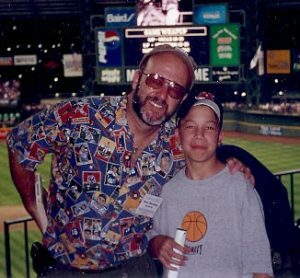 My ten-year-old son, Mat, was really into collecting baseball cards, as I had been forty years earlier. This provided me with an opportunity to spend time with him. It was also a time for me to re-discover my old baseball cards, which Mat found only mildly interesting. He wanted to create his own memories with cards of players of his times. Skowron 1958 ToppsBaseball cards. I was eight years old when I fell under their spell. A friend gave me a handful of my first cards that summer. I remember that 1958 Moose Skowron with the orange background. Each night I put the cards under my pillow. Each morning I awoke to examine them. And always sitting on top was “Moose” Skowron, first baseman for the New York Yankees. He seemed to be looking up and squinting, as if the rays of the sun were scoring a direct hit on his face. And from his to mine. I enjoyed seeing Mat relish these simple pieces of cardboard with player pictures on them and numbers on the back, as I had done forty years earlier. Mat didn’t sort his cards in any certain way. He simply enjoyed them. They were a link to both sports heroes and journeymen, to the game of baseball. They were also a link between my son and me. Mat and I started frequenting sports card stores and shows; the latter were in area malls on weekends. It was late in the summer of 1998, at one of the neighborhood card shops that I first saw them. There was a box of cards, sitting in a corner on a shelf, black and white photos of players (“kind of boring-looking,” Mat had said). These cards were certainly not hot sellers. Here was a box of a few hundred cards (330, to be exact, numbered 1-330) of players from the early twentieth-century, with crisp and revealing photos, crammed with statistics and stories on the back. I had no idea I was about to start on the journey of a lifetime. I had found Urban Shocker. Or perhaps he had found me. I soon found out that these cards were called Conlons. Charles Martin Conlon [1868-1945] was a master baseball photographer who took thousands of pictures from 1905 until 1942. In the late 1980s and early 1990s, a company called Megacards came out with these cards of old players, using Conlon’s photos, which they licensed from the Sporting News. For four years, they issued a different set of 330 cards, consecutively numbered, for a total of 1,320 in all. I was dumb-founded to learn that these cards bombed, at least commercially, and Megacards was no more. I bought my first box of Conlons. Brand new, it cost only $15 or $20, less than a dime a card. While my old baseball cards are now worth $5 to $50 each, these cards continued to have only a nominal value. I didn’t care. I pored over them as I as I hadn’t done in forty years, when “the Moose” came into my life. So many stats, and what is baseball without numbers? So many stories, and what is baseball without timeless tales of a game that hardly changes. The Conlons cards were transporting me back in time to baseball’s golden age. They were my ticket into a ballpark I was born too late to enter. Baseball in the Teens and Twenties. I wanted to taste it, to feel what it was like to be a fan in those days. Better yet, to get to know some of the players. Card, #114, Urban Shocker. (And I used to think that Van Lingo Mungo had the best name in baseball!) It sounded like a gang name or a terrorist attack today’s lexicon. When I flipped the card over, I realized this really was a player’s name and not some baseball event in a big city like New York or Chicago. Urban Shocker. My curiosity did not stop there. I quickly saw that this player had a terrific record of 187 wins and only 117 losses, an incredibly high winning percentage. He had a low earned run average of 3.17, during the start of the Lively Ball Era. Why had I never heard of him? 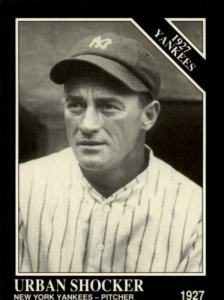 Card #114 then revealed some more intriguing data: This Urban Shocker was a star on the New York Yankees, a teammate of Babe Ruth and Lou Gehrig. He had a record of 19-11 for the 1926 pennant winners and a record of 18-6 for the great 1927 Yankees, the team that is considered one of the best of all time. Finally, the card revealed one more piece of information, which wove the final piece of the web for me. Urban Shocker died of heart disease in 1928, just a year later. He was only thirty-seven years old. I had a decent grasp of baseball history, but I never even remotely had heard this name Urban Shocker before. As I was approaching the age of fifty, for the first time in my life I was facing my own fears of mortality. I was wondering how I would make my mark, how I would be remembered. I was not feeling old; I just realized I was no longer young. And I was undergoing an enormous upheaval in my way of life. I was running hard, running uphill, but running in place. I was becoming the Beatles’ “Nowhere Man.” My life was undergoing a major change. I had decided to sell almost all of our family-owned, small-town retail apparel stores. Our Hub Clothing stores were in six western states. In our peak years, the early 1990s, we had doubled in size and volume in a decade. We were a company of more than 500 employees and sales of more than $40 million. I had spent twenty years building an intimate, personable company, based on Core Values of Caring, Integrity, and Trust. After four generations and more than eighty years of the family business’s brave performance competing against far larger companies, it was time to fold our hand. It was time to move on. A family business is a special thing, not to be tossed aside lightly. I had been given the responsibility of running the family firm back in the 1980s. There was no formal process. I simply had inherited it by default, as the oldest son. It seemed to me like the Olympic torch. I have been running with this torch, protecting it and making sure the flame kept burning until I would pass it on to the next generation of Steinbergs. Now I no longer wanted my children to deal with the demands and pressures that came with it. Could they really and freely choose what they wanted to do with their lives if they felt obligated to carry the flame? If they were to take the torch, would it sear their souls? For more than twenty years, I hadn’t given myself the permission to explore other options. It was time for me to release myself and my children from this obligation. Urban Shocker. He intrigued me from the start. Here was a man who was taken away from this world before he reached the age of forty. Here was a star, who is hardly remembered today. He seemed like an important part of baseball history, and I had to find out more about him. If a star could be so easily struck down, so easily forgotten, surely I did not stand a chance. Deep down inside, my fear of dying, of being lost in the crowd, became real . . . and haunting, especially if baseball stars become dim memories. When I was growing up, my hero was Sandy Koufax. The Los Angeles Dodgers’ pitcher dominated the game from 1962 to 1966 as few pitchers have over a five-year span. He also led his team to three pennants and two World Series championships. His career was rudely shattered at the age of thirty, when arm trouble forced his retirement. The sudden end of his career had hit me hard. I was sixteen. I imagined kids in the 1920s were equally stunned and saddened by the sudden end of Urban Shocker’s career. Almost overnight, both men went from stardom to the archives. And in Shocker’s case, to death a year later. I could not get him out of my mind. I kept coming back to his card, which had quickly risen to the top of my Conlon box. It was almost as if Urban were tugging at me, trying to get my attention, the way he looked at me almost beseechingly from card #114. Partly out of curiosity and partly out of a strange pull I could not understand, I decided to find out more about this man. Not knowing whether I owed it to myself or to Urban, I committed to a journey of discovery. My search for Shocker. Though I didn’t realize it at the time, I was searching for myself too.